The Michigan City buoy serves many audiences. 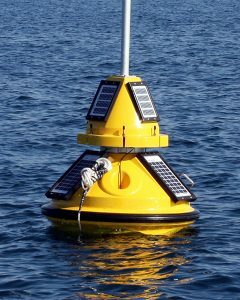 The National Weather Service uses buoy data to forecast wave and weather conditions, observe current conditions, and adjust forecasts to match changing conditions. Recreational users of the lake also benefit from the data provided by the buoy. Boaters, anglers, paddlers, and surfers use the data to make decisions about their personal safety, i.e. assess conditions before traveling out for the day. Charter fisherman use the data to make decisions about the safety of their customers and crew, and also which locations will be good for fishing depending on the current wind, wave, and temperature conditions. Purdue University’s Lyles School of Civil Engineering created the anchor used to keep the buoy in place. They also maintain and help deploy this buoy each year. The Michigan City Port Authority and the Lake Michigan Indiana Department of Natural Resources office played pivotal roles in helping deploy the anchor. The buoy itself was funded through a grant from Illinois-Indiana Sea Grant. A grant from the Indiana Department of Natural Resources Coastal Management Program allowed for the addition of the temperature chain.